Squamous cell carcinoma (SCC) represents more than 90% of all oral malignant neoplasms and poses a considerable risk of mortality if intervention is delayed.,, Risk factors for oral SCC may include and are not limited to the tobacco (chewable and nonchewable) and alcohol consumption, human papillomavirus infection (high-risk genotypes), and a “cancer-prone diet” which is low on fresh fruits and vegetables., The prevalence and incidence of oral SCCs in the Indian subcontinent are alarming due to the predominance of tobacco consumption. However, this disease entity may have an idiopathic component to its etiology as genetic and environmental factors may either afford protection against the development of oral SCC or may predispose to or even promote the development of oral SCC. Wide surgical resection with adjuvant radiotherapy/chemotherapy remains the treatment modality of choice for SCC. However, the reconstruction and rehabilitation of the defect created pose a challenge for the prosthodontist as the obturator prosthesis designed usually tends to be bulky causing discomfort to the patient. This article describes the rehabilitation of a patient who had undergone subtotal maxillectomy with a completely hollow lightweight prosthesis fabricated using a modification of the lost-wax technique. 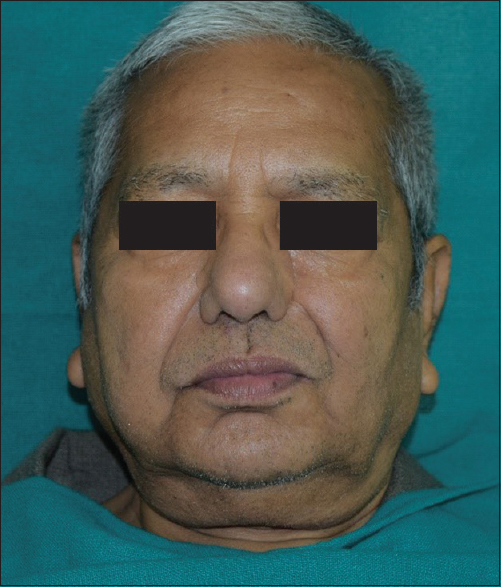 A 79-year-old elderly man had presented to the Department of Prosthodontics with the chief complaint of inability to chew effectively due to a “big hole” in his mouth following surgery. The patient's medical history revealed a diagnosis of SCC of the maxilla about 5 years ago. 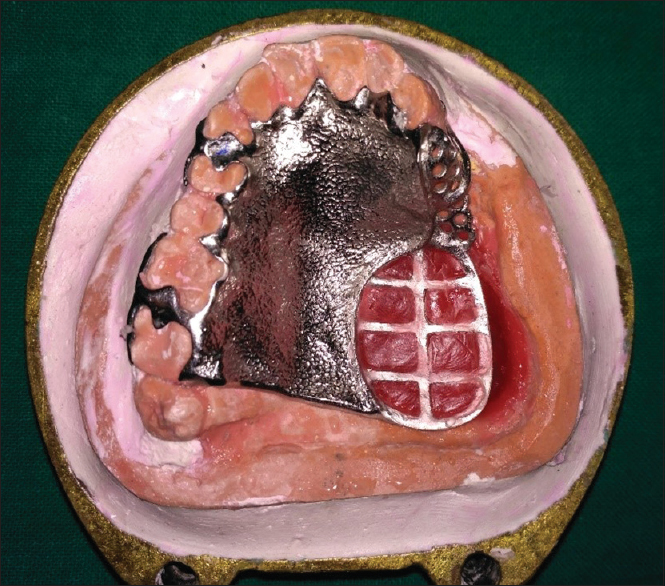 A 5-year follow-up revealed no recurrence, but the patient's quality of life was affected because of his inability to chew properly due to the lack of posterior teeth in his second quadrant along with a defect in his hard palate. The patient though advised rehabilitation earlier did not go through with the treatment for financial reasons and continued to suffer from his oral impediment. On examination, a depression was observed on his left cheek which affected his appearance. Intraorally, the maxillary defect was classified as an Armany Class II defect. The oral mucosa was healthy with no signs of pathology. An extremely lightweight obturator was planned for the patient using a novel technique which modified the lost-wax procedure used in metal casting. A thermoplastic resin sheet (Andent India Pvt. Ltd.) of 2 mm thickness was adapted over the duplicated cast [Figure 2]. 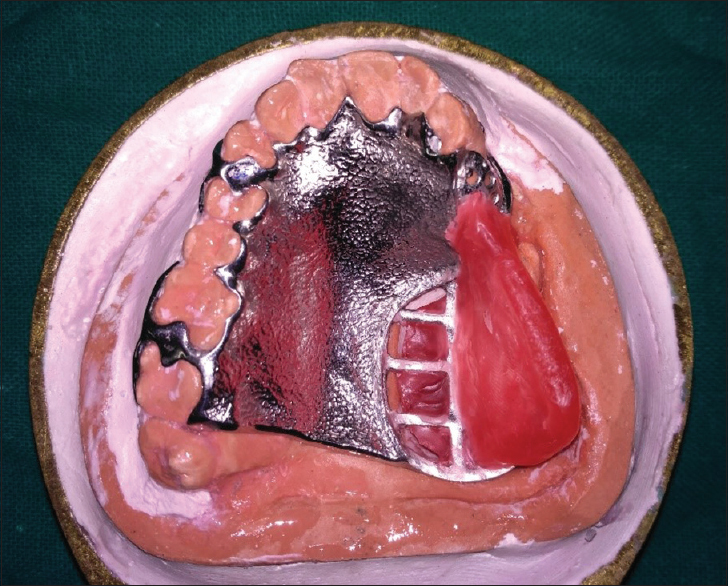 The openings were then sealed with autopolymerizing resin, and the prosthesis finished, polished, and delivered to the patient [Figure 7]. A 2-month follow-up revealed a happy patient who experienced a considerable improvement in speech, function, and esthetics [Figure 8]. It is a well-established fact that hollowing an obturator leads to a significant reduction in its weight (6.55%–33.06%) depending on the size of the defect. Over the years, numerous techniques have been employed for hollowing an obturator with materials such as sugar, ice, and polyurethane foam. Polyvinyl siloxane putty has been used, but that requires creating large access channels to scrape out the material. Resealing the channels with auto-polymerizing resin or light-cured resin can be quite cumbersome. The above-mentioned techniques also require the use of two copes during acrylization. Recently, a lost-wax bolus technique has been suggested to hollow an interim obturator prosthesis. A problem that is frequently encountered with the above techniques is the difficulty in achieving a uniform thickness of heat processed resin around the bulb. 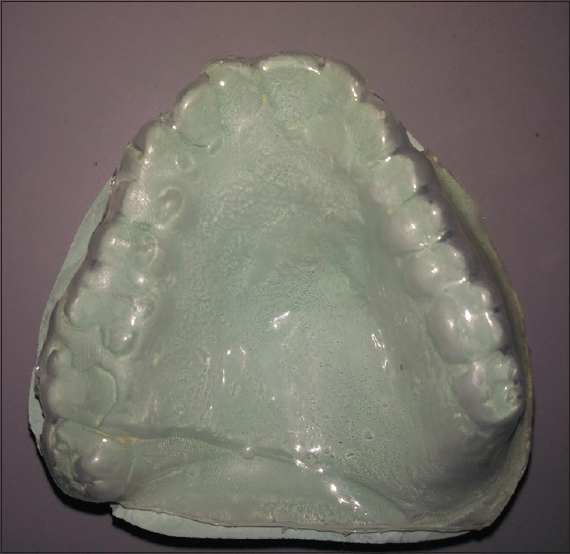 This article describes the use of a thermoplastic sheet to replicate the final cameo surface of the denture and thus achieves a uniform thickness of resin around the hollow portion of the denture. 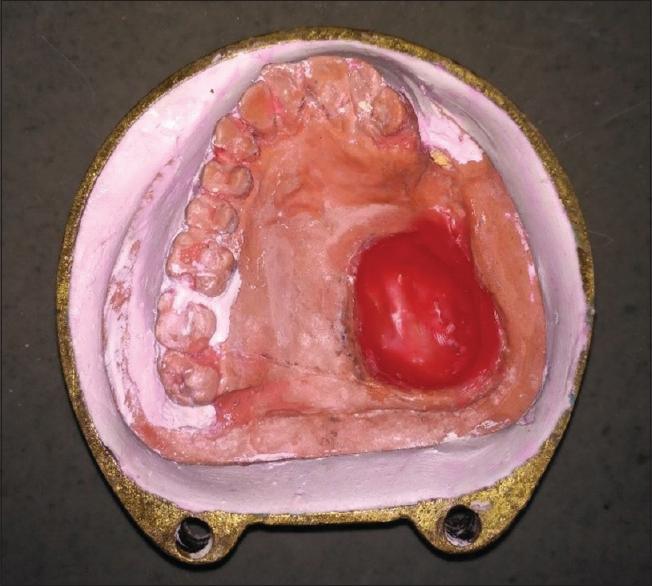 This combined with the use of wax provides a greatly simplified technique for the fabrication of a hollow definitive prosthesis in a single-step while maintaining a predictable thickness of resin. An obturator prosthesis is still considered to be one of the more affordable reconstructive options for patients postexcision surgery. Prosthetic rehabilitation focusses on decreasing the weight of the obturator for better patient tolerance and comfort while not compromising function. 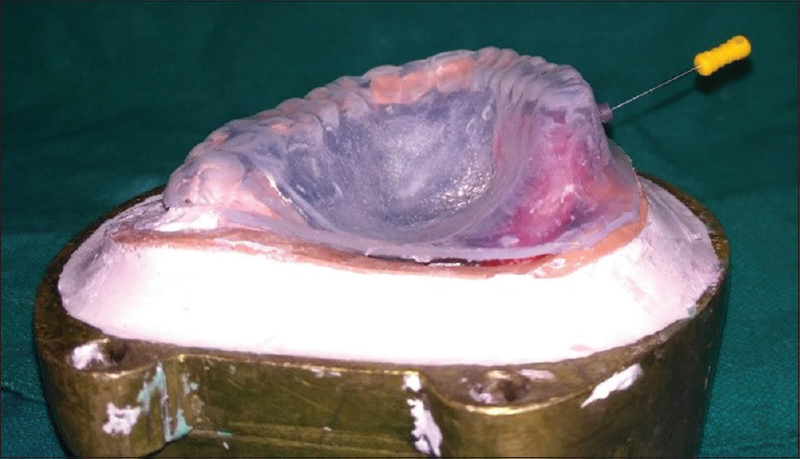 The technique followed in this article is relatively simple and cost-effective as it uses easily available modeling wax to successfully hollow the definitive obturator prosthesis. A single flasking procedure was adopted, and no additional material or equipment was required in the process. The use of the thermoplastic template ensured a predictable thickness of resin around the cameo surface of the prosthesis. 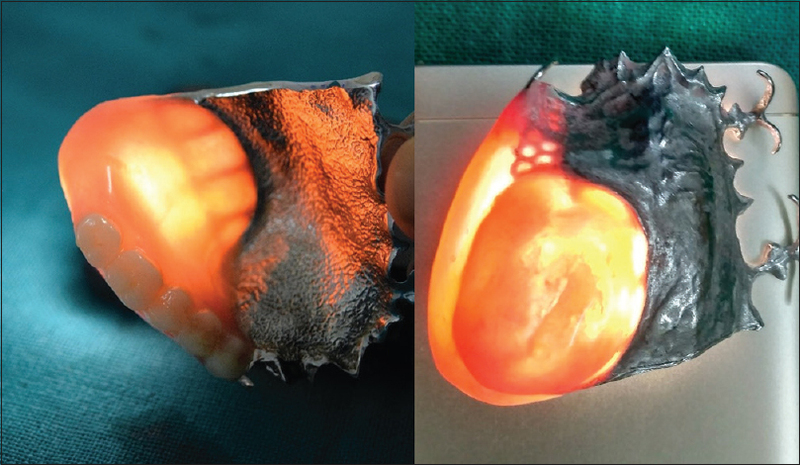 This article describes a single-step fabrication of a closed hollow-bulb obturator prosthesis with a uniform thickness of heat cured resin encapsulating the hollow prosthesis. Attar E, Dey S, Hablas A, Seifeldin IA, Ramadan M, Rozek LS, et al. Head and neck cancer in a developing country: A population-based perspective across 8 years. Oral Oncol 2010;46:591-6. Petti S. Lifestyle risk factors for oral cancer. Oral Oncol 2009;45:340-50. Feller L, Lemmer J. Oral squamous cell carcinoma: Epidemiology, clinical presentation and treatment. Cancer Ther 2012;3:263-8. Aramany MA. Basic principles of obturator design for partially edentulous patients. Part I: Classification. J Prosthet Dent 1978;40:554-7. Wu YL, Schaaf NG. Comparison of weight reduction in different designs of solid and hollow obturator prostheses. J Prosthet Dent 1989;62:214-7. Parel SM, LaFuente H. Single-visit hollow obturators for edentulous patients. J Prosthet Dent 1978;40:426-9. Schneider A. Method of fabricating a hollow obturator. J Prosthet Dent 1978;40:351. Tanaka Y, Gold HO, Pruzansky S. A simplified technique for fabricating a lightweight obturator. J Prosthet Dent 1977;38:638-42. Patil PG, Nimbalkar-Patil S. Lost wax-bolus technique to process closed hollow obturator with uniform wall thickness using single flasking procedure. J Indian Prosthodont Soc 2017;17:84-8.